The Hockey Foundation is offering a raffle to support our fundraising efforts in advance of our next trip to India. We're excited to offer you some unique raffle prizes, and wanted to take this opportunity to explain what makes each prize significant to our us, and hopefully to you as well. If you've been thinking about donating, this is a great option to get a little something in return beyond supporting a great cause, changing the lives of countless children (and adults!) and being a part of something bigger than oneself, of course. Green Vibrance, is a green super food. It's a powder of many greens, and then some! There are 74 ingredients in Green Vibrance, with 25 billion probiotics per serving, and can be mixed in water, juice or other liquids. When our team of coaches is in Ladakh, one of the biggest problems we all have to deal with relates to our diet, but it's not what you think. Sure, Ladakh is in India, a country famous for "Delhi belly", a particularly un-fun food-borne stomach illness, but Ladakh has cleaner spring water than most of India, and rarely gets to a temperature (especially in the winter) that allows harmful bacteria, viruses and protozoa to fester and multiply. The problem in Ladakh is that during the winter there are very few options for a nutritious balanced diet. That's not to say our team is looking to eat as per the famous USDA food pyramid (there are too many Pringles and Snickers consumed), but the distribution of vitamins and minerals doesn't seem to be present in the salt & carb-heavy diet of Ladakh. Green Vibrance has been the complement and supplement that keeps our team healthy, energetic and digesting well. When they return to lower parts of India, such as Delhi, Green Vibrance adds the additional support of keeping our team "regular", as the probiotics digest much of the stuff that can contribute to "Delhi belly" and the rest of the ingredients boost immune system and digestive system function, creating a tough battle for the harmful organisms. The taste is pretty neutral, and with some juice, it's barely noticeable. The benefit is obvious! Vibrant Health has donated two 30-day supplies of Green Vibrance for our raffle, ending 11/25/13. Being a New York City-based non-profit, we're excited to offer 2 annual memberships of Citi Bike, courtesy of NYC Bike Share. This new bike-share program is less than a year old and already seen over 10 million miles traveled in over 6 million trips by nearly 100,000 annual members & countless 24-hour & 7-day pass-holders. Riding a bicycle is one of the best ways to train for hockey. The leg muscles get a great workout that contribute to power, endurance, agility and overall wellness. Players like Jaromir Jagr and Chris Chelios are famous for riding bikes before and after hockey games to maintain peak physical conditioning. Whether you own a bicylce or not, having a Citi Bike membership is a great perk for any New Yorker, as sometimes you don't want to drag your own bike around all day or lock it up in areas that may not be reliable. For non-New Yorkers, if you have a friend or family member that lives in the area, this is a great gift for the holidays, but you can only win it if you enter our raffle, ending 11/25/13. Keeping with an NYC-theme. NYC Skate Pro, the pro-shop at City Ice Pavilion in Long Island City, Queens, has generously donated a card for 10 free ice skate sharpenings, whether it be hockey, figure or speed skates. Sharpening ice skates in NYC is an expensive endeavor, especially if you skate regularly, and there are few locations that facilitate this service. It goes without saying, this is a great prize to win, but only if you enter our raffle. Authors Dave Bidini and Kerry Fraser (the famed helmet-less referee) have both generously donated their hockey books to support our fundraising efforts. Every trip, we donate books about hockey to schools in Ladakh, whether the books be instructional, fiction or in this case non-fiction. 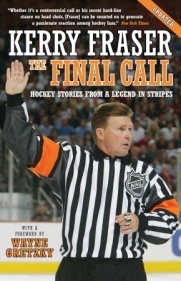 The Final Call is a collection of stories stemming from Kerry Fraser's final season in the NHL. Tropic of Hockey is about one man's journey to find hockey in unexpected regions around the world. Needless to say, we identify with that mission, as The Hockey Foundation operates in Northern India! Of course, you can pick up these books on Amazon, but for only $20 you'll get 5 chances to win both, and still have 4 more chances to win something else! Stay tuned for more updates on our raffle, including information on the rest of our raffle prizes!